A play-within-a-play in the style of Shakespeare in Love - penned by a half-British actor, no less - has become the toast of Paris theatre. The play, Edmond, is now one of the most successful French productions of modern times. French newspaper Le Monde called it "not so much a success as a triumph" - just like the play on which it is itself based. Written by 36-year-old Alexis Michalik, Edmond tells of the creation and triumphant first performance of another play: the classic drama Cyrano de Bergerac, about a lovelorn, long-nosed swashbuckler. It is named after Edmond Rostand, the dramatist who wrote the original in 1897. After opening in September 2016 in the historic Théâtre du Palais Royal, Edmond has been performed more than 1,000 times to about 750,000 spectators. Advance bookings assure it will run for at least another year. And now Michalik - whose mother is from Lytham St Annes in Lancashire - has two more feathers to his cap. His film version of Edmond has come out to critical acclaim in France, and in the UK the play gets its first outing at the Birmingham Rep in March, starring Freddie Fox and Josie Lawrence. Michalik's play is inspired by Shakespeare in Love - the 1998 film which created an imaginary back story to the writing of Romeo and Juliet. In Edmond, we see Rostand - like Shakespeare - desperately seeking ideas for a play he must write in three weeks. He helps a tongue-tied friend to compose letters to his sweetheart, and this gives him the central theme of a romantic hero who hides his own love behind another's. "When I saw Shakespeare in Love I knew I wanted to do something similar, but with a French playwright. The question was, who?" Michalik told the BBC. "And then I read about the first night of Cyrano - how everyone thought it was going to be a flop, including Rostand himself! And how on that first night it was the wildest success imaginable - and I knew I had my subject." Though written at the end of the 19th Century, Cyrano de Bergerac is set in the 1640s. The title character is a romantic musketeer disfigured by a huge nose, who conceals his love for the beautiful Roxanne up until the last fatal scene. An instant classic, it has gone on to be the most-performed French play of all time. Michalik has a top-floor apartment in the 19th arrondissement of Paris, near where he grew up. His English mother met his French-Polish artist father in Greece. "They were hippies together in the '70s," he says. Throughout his childhood the family went regularly on holiday to England. He began as a stage actor at 18, and wrote his first play at 30. "We never had a television at home in Paris. My exposure to television and film was entirely in English. At the same time I was growing up with French literature and theatre," he says. "So I had this double influence. When I write a story, it is always with Anglo-Saxon examples in mind. But I am also nourished by my love of French culture and language." The success of Edmond owes much to its pace, plentiful laughs and simple climactic story. There are 80 scenes, and none lasts more than 45 seconds. The 12 actors - many of whom play several roles - also double as stage-hands. If it feels like a film script that is no coincidence - because that is how it began. Michalik first wrote it for the cinema, and only made it a play when he could find no producer. Now the original movie idea has become reality, with Michalik in the role of Rostand's rival, farce writer Georges Feydeau. After two-and-a-half years, Edmond is the longest-running play at the 700-seat Théâtre du Palais Royal since La Cage aux Folles in the 1970s. There have been a few other blockbusters in Paris over the years - but these have invariably been cliché-ridden vaudeville or French versions of foreign hits. "I spent my 20s doing the Avignon theatre festival fringe, and what you learn there is as much about the economics of theatre as about the art. You learn that the first rule is: get the punters in," he says. "I think our success today is opening doors for new kinds of plays. In Paris, the private - as opposed to subsidised - theatre has been over-dependent on the participation of stars. Only famous names ensured an audience. "But we are showing that with a cast of unknowns, you can do it. As long as you are inventive and have a good story to tell." It is often said that Cyrano de Bergerac was a huge success at the end of the 19th Century because it provided a gloomy and divided country with an embodiment of their idealised national character: the soldier-poet, the visionary of hopeless utopias, the ultimate man of panache. 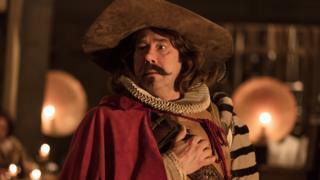 A century on - and in a France once again riven with self-doubt - Cyrano is back, helping people to dream away the gloom.